We have said it before, there are different kinds of concept cars and sometimes manufacturers use the word rather loosely to include teasers of production cars whose designs already set and approved for production. It seems that it is very common today, when product cycles seem to get shorter and shorter and it is becoming impossible to make a “big splash” with every mid-cycle face-lift or hasty rearrangement of a lagging line. 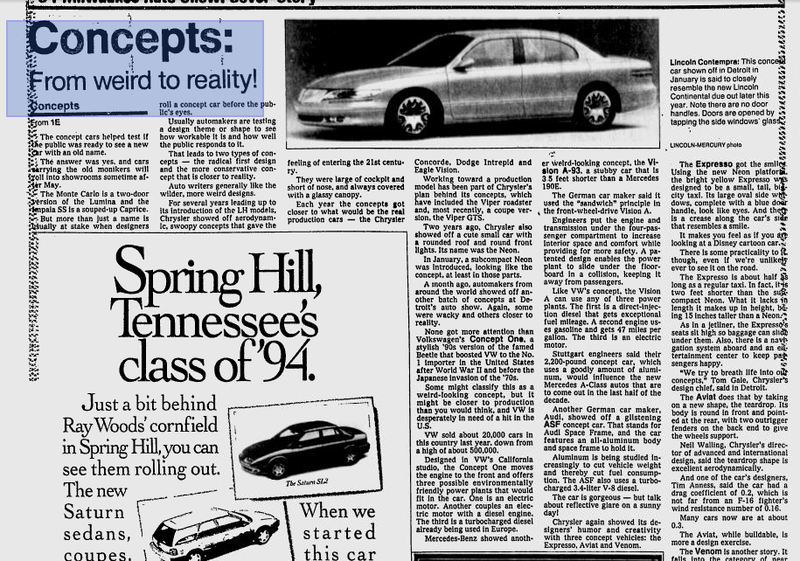 But back in the mid-1990s, Ford used that age-old trick in a rather interesting way. 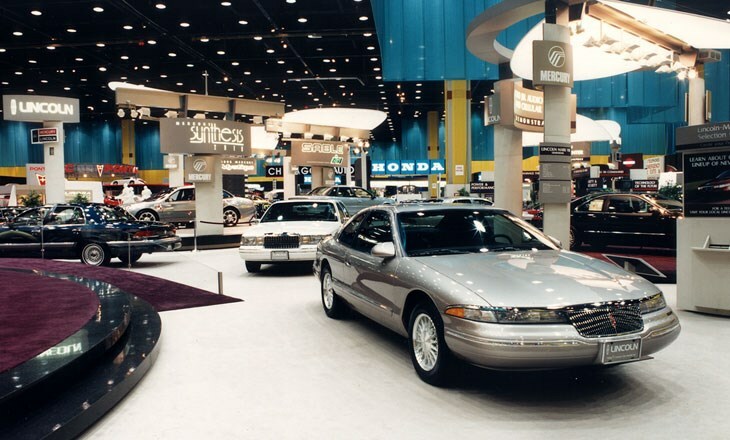 Photo of the Lincoln’s stand at the 1994 Chicago Auto Show. The early 1994 Auto show circuit (in Detroit and Chicago, mostly) was set to be a minor one for the Blue Oval, as a number important new models were already slated for the 1995 model year. 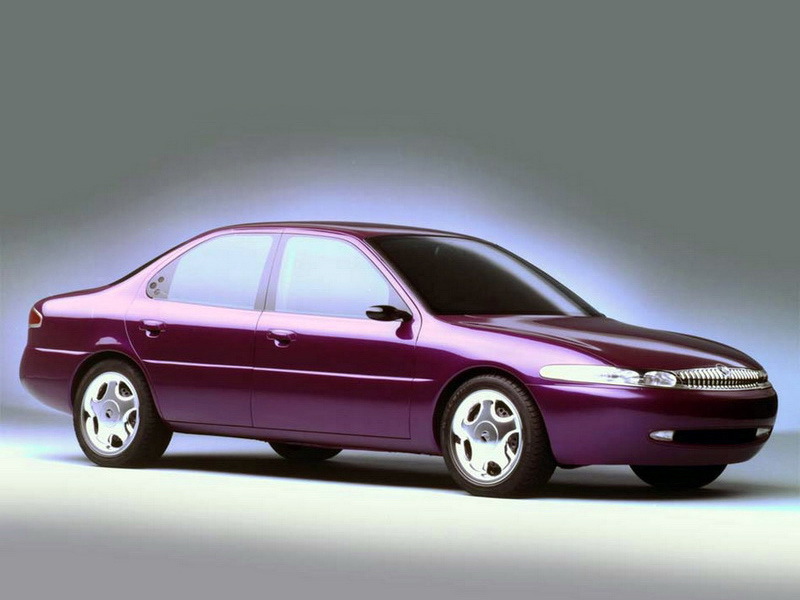 First of all, the North-American versions of its Mondeo world car, which had been released in Europe in 1992 for the 1993 model year to critical acclaim (including Jeremy Clarkson’s): the Ford Contour and Mercury Mystique were thus expected to take the 1995 midsize segment by storm with modern, European architectures and dynamic handling. 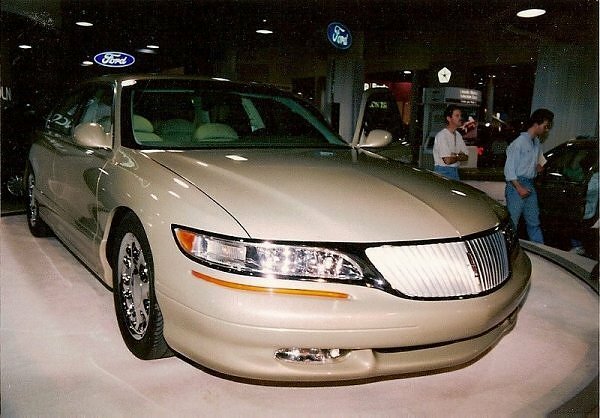 So, to keep the public and the press on its toes, FoMoCo decided to “tart up” both cars with concept car looks and release them respectively as the Ford Profile and Mercury Premys. Apart from the clever names, each sported specific sheet metal that was much more differentiated than the eventual production versions. And while the Profile was all done up in garish ground effects and oval themes, the Premys was actually much more interesting than the production Mystique. 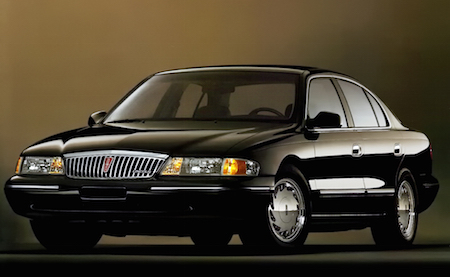 Another very important model for Ford, or rather Lincoln, was the one that interests us here: the upcoming 1995 Lincoln Continental, set to replace the tame 1988-1994 model. So, as with the Mondeo-based twins, Lincoln decided to take the production-ready Continental and fancy it up with some glamourous detailing in order to build some buzz for its new flagship. Enters, the Contempra. 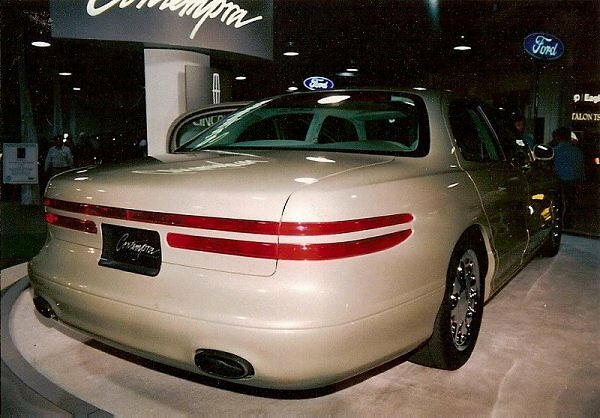 Now, the 1994 Contempra is not Lincoln’s most famous concept-car and as such photos and details are few and far between, but it is safe to say that most technical specifications would have been those of the 1995 Continental. Again, notice the clever name chosen by the folks of Dearborn: as Contour became Profile, and as Mystique became Premys, Contempra represented the contemporary interpretation of Continental. 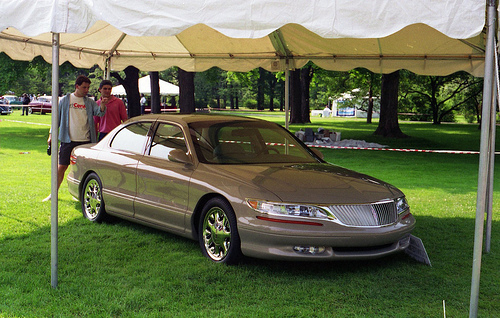 It might also have hinted at the engineers’ and product planners’ contemplation of Continental’s role within the Lincoln line-up because the 1995 ninth-generation Contie took a sharp turn upmarket. Up front, the car sported an integral chrome mask which made for a very modern front fascia. The way the headlights stretched into the fenders and followed into the arch of the wheel wells is not too far from what you find on current full-size sedans – and it is always a good way to hide the front overhang left by front wheel-drive. The jeweled headlamps were also very modern, and the thin slats of the grille offered a very fresh interpretation of Lincoln’s upright waterfall grille of then. The thin headlights are also highlighted by a stand-alone turn-signal strip, which is also reminiscent of what manufacturers can do nowadays with LED lights. Finally, the hood’s character lines seem sharper than the production version, while the sporty bumper houses jewel-like fog lamps as well as styled air-intakes. Again, this is still very current, and shows off much more personality than the production version. Outback, the Contempra paradoxically appears tamer than the production Continental. On the concept, two thin light bars run across the high and bulbous trunk. The visual weight of the rear fascia is not helped by the integral bumper, which is only highlighted by a thin character line where the actual bumper should start and by a set of chromed exhaust pipes. Interestingly enough, there is no Lincoln badging out back, and only a very tiny emblem up front. Other than that, the Contempra literally uses the 1995 Continental’s sheetmetal. On the sides, the only concept-like feature are the door handles, which are actually absent. As revealed by this newspaper article, Lincoln claimed you could open the doors by tapping the side windows’ glass. Presumably, that would have been a system much like the invisible Keypad entry system used on the current MKS for instance. Even the wheels are your typical 1990’s chromed fare. Although the same probably cannot be said for the Profile and Premys, the Contempra seems too tidy and too real to be a last-minute cover-up of the production car. 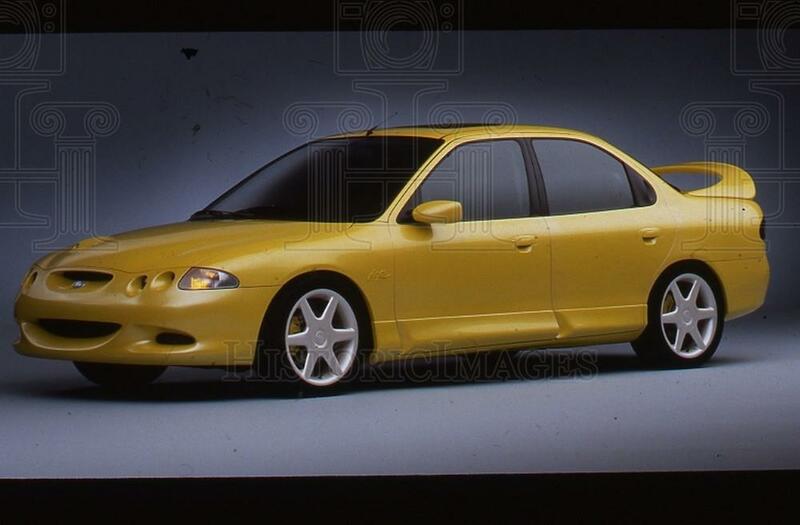 I would not be surprised at all if the Contempra was actually one of the final design options for the production car, not retained for the real Continental but close enough of a runner-up that it got its own little reveal as a concept car the year before. And while the 1995 Continental looked very proper and stylish, the 1994 Contempra surely seemed sportier and more European-like yet – which is interesting given how the Continental’s mechanicals would have aptly matched that positioning. ← Nip-tuck: 2015 Lincoln MKS gets subtle updates!